I come into this review as a fan of the previous series, Last Exile. I found the setting to be different, the characters to be believable, and the story to be an interesting take on science fiction war. I would go so far as to say that it is the sort of anime that you could show to non anime fans and they wouldn’t be lost, since it doesn’t rely on many anime tropes and styles of storytelling which might confuse those unfamiliar. The art style lent itself to such a show, and the pedigree of the production staff made the series, to me, an instant classic. For example, Last Exile begins with an opening song and animation that grabs your attention then sweeps you across the new landscapes you’ll be seeing, showing characters and events which are meant to make you wonder a bit about the direction this series will take. The opening scene is of a battleship in the clouds, towing a small scout of some kind called a “vanship”. It is dangerous work and they seem to be seeking something, then the vanship is lost spelling tragedy. Just being thrown into this series leaves you wanting to know more and yet you’ve already learned a lot without a historical scroll or having the main characters recap the setting. Nine years pass and the opening to Last Exile-Fam The Silver Wing goes as follows; we look upon a strange sky of six moons, a young woman stumbles into frame, proceeds to disrobe to her underwear, then bungee jumps sleepily out into the void. At the end of the rope a bell jingles and the rest of her friends are roused from their sleep on the flight deck of the airship and then proceed to mock her. This tells me a little about how far removed we are in nine years. One thing that disturbs me a little out of the gate on this series is the fact there is a short collection of manga that bridges both series. I’m not one who enjoys needing separate media just to enjoy another part of the same series. This is compounded by the fact that, to the best of my knowledge, this bridging series never came to the states. But the series can work on its own save for a few sore spots. For instance: the character of Dio, who was a major factor in the original series, finds himself in this series as well. Now, I don’t wish to spoil Last Exile for you and I won’t, but if you’re going to bring in such a character it kind of requires you to give the original audience a reason for it. Watching the first series can get you to connect the dots that would lead him in this series a world away, but it really is jarring in a sense. But Fam The Silver Wing is its own entity to a point, and can be enjoyed for what it is. The story centers around Earth, the home of humanity left behind when the Exile ships took mankind to the stars to escape some sort of catastrophe never mentioned. 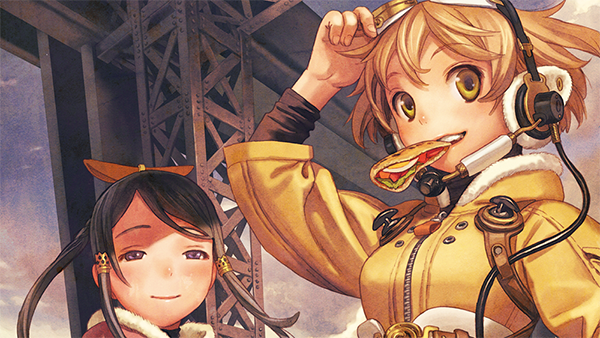 In particular we examine the chronicles of Fam, a sky pirate of great skill that captures large airships in her vanship with her navigator, Giselle. On a typical hunt the pair decides to intervene on a peace treaty between the Kingdom of Turan and the Ades Federation. But the Federation betrays the truce, so the sky pirates save the capital ship along with the younger of the princesses of Turan, Millia. The series follows their struggles to stop the Federation from their plans to stop the colonists from returning home and uncover the more sinister plots involving the super ship, the Grand Exile. This would all be pretty cut and dry for anyone who hasn’t watched the first series, but for me there is this nagging feeling that all they did was recycle many elements from the first series. Sweet battles between airships? Check. Vanship racing? Check. Mysterious circumstances of the higher technology and bloodlines in relation to the Exile ships? Check. A special airship stumbled upon by our protagonists that is stealthy, super and possibly the finest and most noble crew in the world? Check. No matter how many sky pirates are sprinkled on there, it seems like there is a lot of retreading of old ground. That isn’t to say that this series doesn’t have its own ideas and themes. Besides sky pirates there are gaggles and gaggles of ladies. I know there are a great many anime series out there that have a majority of their cast be male or female, but something seems a little off this time. The Last Exile series has never been one to tout sexuality to draw in viewers, and this isn’t the case this time either. However, every male is either inconsequential to the scheme of the plot, used for some scene establishment or foppishly comedic. All of our major protagonists are ladies, with a rare dash of girl crushes (or as the kids today call it, some “Ho-yay”) to keep things interesting. Having one gender dominate the cast happens often enough in series such as Gurren Lagann, but that series had no precedent to hold up to in that regard. In Last Exile gender didn’t define roles, but somehow Fam The Silver Wing decided the way to differentiate itself from the pack would be to follow the current trends in anime and heavily lean on a female heavy cast roster. It’s my own prejudices I carry from being a fan of the original series that keeps me from really giving this series all of my praise. The animation is just as great as it was in the original. The airship battles are gorgeous even if they are lacking some of the human element I felt in the first series. Save for a few spots, all the characters are well fleshed out and believable. The voice acting in the English dub is fair, save for some minor annoyances I find in casting of young boys in ridiculous situations. The Japanese dub is exceptional as is expected. Koichi Chigira and Gonzo team up well on all their projects together, so I can’t say I’m disappointed from a technical standpoint at all. And after the initial shock of the changes, I found a good story within it all. It is not an exceptional story in the anime world today, but something entertaining with a good cast to back it up. At the end of the day that is all we can hope for, a little something to entertain us that is executed well. It is a series I feel we didn’t need or want, but it’s nice that it came along.